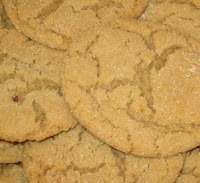 Brown sugar cookies store well for gift giving. Put them in a resealable plastic container, place a bow on top and add the recipe card. Mix brown sugar and shortening, pressing out lumps with the back of a large spoon or the tines of a fork. Stir flour and baking soda until well blended. Add a little bit of milk if the dough is too dry. Spray cookie sheet with spray oil. Place large spoonfuls of mixture on the cookie sheet. Place in center rack in oven.